Duct furnaces are heating devices that use a system of ductwork to distribute warmed air throughout the space to be conditioned. Commercial furnaces, based on GAMA and DOE definition, are gas and oil fired furnaces rated at 225,000 Btu/hr or more. Electric furnaces are also available although gas and oil models dominate the market. For a gas-fired commercial warm air furnace with capacity of 225,000 Btu per hour or more, the thermal efficiency at the maximum rated capacity (rated maximum input) must be not less than 80 percent. For an oil-fired commercial warm air furnace with capacity of 225,000 Btu per hour or more, the thermal efficiency at the maximum rated capacity (rated maximum input) must be not less than 81 percent. Electric furnaces are not specified in the DOE energy efficiency regulations, although electric motors are covered extensively in the DOE’s efficiency rulings. The basic furnace consists of a metal box containing a blower, multiple gas/oil burners or electric resistance coils and a heat exchanger. Air is drawn into the furnace where heat from the burners or electric coils is transferred to the air via the heat exchanger. The warm air is then blown throughout the facility via metal or plastic ductwork. Many gas and oil furnaces feature two-stage firing which uses less fuel to maintain comfortable indoor temperatures during periods when less than full furnace capacity is needed. Gas and oil furnaces require an exhaust system to expel the products of combustion, which can be either gravity vented or power vented. Power venting with sealed ducting prevents loss of room air and is considered a higher efficiency option. Some manufacturers offer an electric duct heater, which is a self-contained heating unit designed for installation in the air handling system or ductwork. These units can be used for primary heat, preheat to temper air where it enters the building, reheat to raise the temperature of previously heated air, or as supplemental heat to boost the heating capacity of another piece of equipment such as a heat pump. Highboy – Similar to the typical residential furnace, highboys are suitable for a utility room, basement and factory floor. Horizontal – No special separate room is needed. The furnace can hang from the ceiling in service stations, factories and warehouses. Counterflow – Often found in slab buildings and crawl spaces. Lowboy – A low profile makes it suitable for basements. Rooftop – Offering the same features as indoor duct furnaces, rooftop duct furnaces are equipped with rail mounting and watertight construction. A feature offered by many manufacturers is separate combustion wherein the furnace uses outside air for combustion. Furnaces with separate combustion are designed for buildings with negative pressure or extremely dirty or mildly corrosive atmospheres. Only a single penetration through the building is required for both combustion air and exhaust. Separate combustion helps overcome slight negative pressure within the building. Also, the burners, pilot and flue system are enclosed within the unit which protects them from indoor contaminants such as dust, humidity and chemicals. 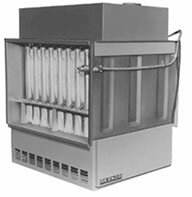 Commercial/industrial furnaces of 100,000 to 400,000 Btuh input are common, but models up to 1,000,000 Btuh are available.